This week primary colors and type caught my eye. Specifically these juice glasses from Crate and Barrel that feature letters as fruit. And these napkins from Oh Little Rabbit and hand towels from the MOMA feature illustrations reminiscent of 1950s cookbooks. 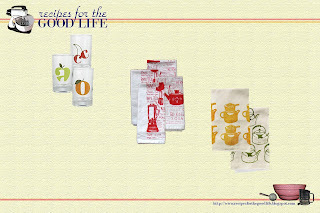 Where to Get the Look: Juice Glasses from Crate and Barrel $2.95 ea; Organic Kitchen Gadget Cotton Napkins from via Oh Little Rabbit (Etsy) $20 for a set of 4; Object Tea Towels via At Home with Kim Vallee, $16 ea. Anything with type catch your eye this week?